The MGB GT V8 was one of those perfect matches of components it really was surprising it took a private entrepreneur, Ken Costello, to bring it to the market place. He saw the opportunity for the MGB engine bay to accommodate a bigger engine. After all, it was designed to accommodate a V4 engine that never got to production. The Rover V8, nee Buick/Oldsmobile/Pontiac 215, was first fitted to a Rover P5B in 1967. The engine transformed the rather staid Rover and in the following years, several other Rover cars benefited with this engine. Morgan brokered a deal to use it in the recently demised Plus 8 model, a brilliant demonstration of the engines sports car potential. The engine was a natural for the MGB, as not only was the engine bay ideally suited, but the all alloy V8 weighed virtually the same as the B series engine, so the handling was not upset in the same way that occurred with the MGC. It was powerful and efficient so the stunning performance was not at the cost of huge fuel bills. BL was not blind to this and authorised Abingdon to produce their own version – within a straightjacket budget! Nevertheless, they managed to do a sterling job and the result appeared in mid 1973. 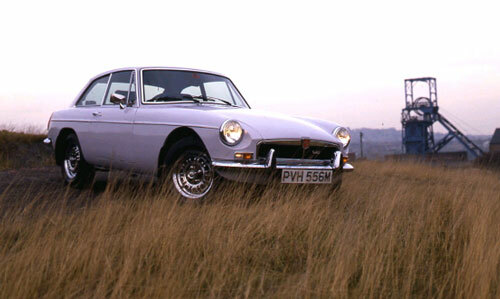 The main criticism at launch was that the car looked too similar to the normal MGB GT but cost much more. The fuel crisis’s following the October 1973 middle east war set the scene for the demise of many big-engined cars, and this was the case for the V8, irrespective of the near 1800cc fuel economy, as in 1976 it was dropped after just 2591 were made. Since then, it is estimated more V8 conversions have been done. Engine: 8 cylinder in 90 degree V formation. Bore/stroke: 88.9 x 71.1 mm. Valve Operation: Single camshaft chain driven from crankshaft operated by pushrods and rockers. Hydraulic tappets. Carburation: Two constant vacuum SU HIF6 carburettors, horizontally mounted. Power output: 137 bhp at 5,000 rpm. Max. Torque: 1931b ft at 2,900 rpm. Gearbox & Clutch: Four speed all-synchromesh manual gearbox with Laycock overdrive as standard. Borg & Beck 9.5" dia clutch. Rear Axle: Salisbury with 3.07:1 ratio as standard. Suspension: Front; independent by upper and lower wishbones, with coil springs and anti-roll bar. Lever arm hydraulic dampers. Rear; live axle, half-elliptic leaf springs. Lever arm hydraulic dampers. Wheels and Tyres: Dunlop ventilated cast alloy centre on steel chrome rim, 4 stud fixing, 175 HR14 radial tyres. Brakes: Lockheed front wheel discs and rear drums. Single hydraulic circuit with servo assistance. Steering: Cam gear rack and pinion with safety collapsible steering column. Wheelbase: 7' 7". Track: Front 4' 1", rear 4' 1.25". Length: (Chrome bumper) 12' 10.7", (black bumper) 13' 2.25". Width: 5' 0" Height: 4'2". Number Built: (Chrome bumper) 1839. (Black bumper) 742. Performance: 0-60 mph 7.7 secs. Max speed: 125 mph. Standing quarter mile 15.8 sees. Price: New in 1973 £1,925 rising to £3,317 in 1976.